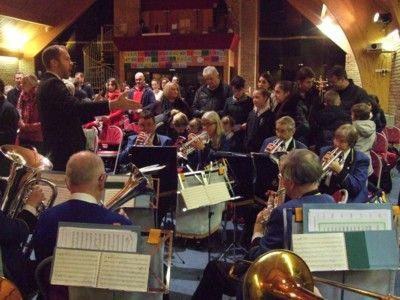 Cranleigh Rotary's annual schools carol concert was held at Cranleigh Baptist Church on Wednesday, 13 December. Three local schools participated: St. Cuthbert Mayne, Cranleigh Primary, and Wonersh & Shamley Green Primary. 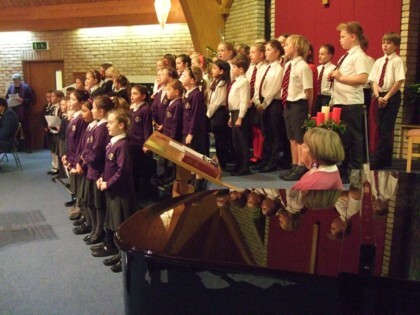 Youngsters from each school entertained the audience with a 'solo' carol and joined with the other two school choirs for three combined carols. In addition, everyone was able to join in with four ‘community carols’. The evening was led by Rev'd Sally Davies from Shamley Green, who introduced the carols and gave a short talk about the wonder of God coming down to Earth at Christmas. Godalming Town Band provided the splendid musical accompaniment. "What a great atmosphere prevailed throughout the concert," said Rotarian David Barry, who helped to organise the event. "The enjoyment of the chorister children was particularly evident. "We are most appreciative of the Cranleigh Baptist Community’s generosity in allowing us to use their wonderful venue." The net proceeds of more than £100 from the door collection are being donated to Cranleigh Food Bank.